A Dialogue webNovember 15, 2014, Alberta Street, Portland, OR – Take a ride or walk down Alberta Street and discover two new public street seats in front of the Tin Shed and Vita Café. 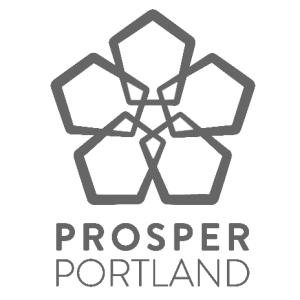 Two years ago the Portland Bureau of Transportation (PBOT) inaugurated its Street Seats program, which allows businesses and nonprofit organizations to convert on-street parking spots into other public uses, such as café seating or miniature parks. 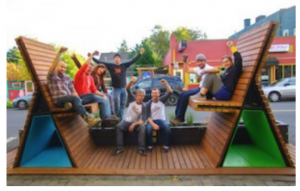 In tandem with the city’s Street Seats program, the Portland chapter of the American Institute of Architects (AIA) and its nonprofit Center For Architecture (CFA) sponsored a juried street seats competition, themed “Active Streets.” Designers were asked to create healthy, social and playful structures. The two winning designs were built and installed in front of the CFA on national Parking Day and stayed there for the month of October. Hoping to find a forever home for the Street Seats, the CFA donated them to Alberta Main Street (AMS). “We were elated to receive such a generous donation. At our community visioning session four years ago and in all of our subsequent community surveys, public space has been a constant request. With very few opportunities to deliver on this request, we were seeking unique opportunities to create public space, so this is definitely a win win,” said Sara Wittenberg, AMS Executive Director. AMS selected placement sites in front of the Tin Shed and Vita Café; the businesses will be responsible for maintenance and insurance. “We are thrilled to be selected as a placement site for one of the public Street Seats. We’ve received so much love from the community over the years and it’s great to be a part of something that continues to grow. The sense of community on Alberta Street is already remarkable; we are thankful to be playing a role to further inspire community interaction ”, remarked Christie Griffin, co-owner of the Tin Shed. Getting the seats to Alberta was no small fete. As with any AMS project, the community came together to make it happen. A week-long social media fundraising effort generated funds to cover moving costs, community volunteers stepped up to disassemble, transport and reinstall the Street Seats on Alberta Street and PBOT helped navigate permitting and logistics. “We are so appreciative of the community for coming together to make this happen. 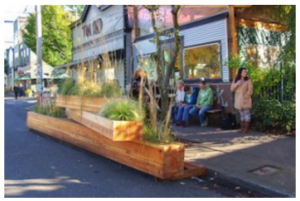 The Street Seats are so unique; they will naturally build a stronger sense of place on Alberta Street. ” said Michelle Ruber, AMS Design Committee co-chair. “A Dialogue” by a team from Scott Edwards Architecture including Ali Karlen, Ryan Yoshida, Jesse Graden, Brian Morris, James Lee, Sarah Cantine, Joe Broder, Andrew Stohner, and Chris Olenyik is sited in front of Vita Café (3023 NE Alberta Street).